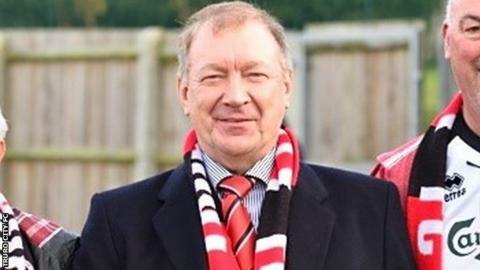 Truro City owner Pete Masters has predicted a "difficult" season in National League South, but says the club will not suffer relegation. Truro were promoted from the Southern Premier league last season with a 1-0 play-off final win over St Neots. The White Tigers are currently 17th in the league, having lost 2-1 to Hayes and Yeading on Tuesday. "It's going to be very difficult. Last time we were here we struggled," Masters told BBC Radio Cornwall. "This time we've got more resources behind us and we've got a better team." Truro came close to going out of business before Masters bought the team in 2012, but the owner revealed funds are available to manager Steve Tully if he needs to strengthen the squad. "Steve has got the resources there, he's got to do what he's got to do and if he needs new players he'll do it," Masters added. "The first four games he's looking to see who's up to the mark. "If they're not up to the mark I'm afraid they'll move on, but at the end of the day we're going to stay in this league and we'll move forward."